The castle of Wester Greenock Schaw once stood here, overlooking Greenock and the Clyde beyond, but only the gate piers and well associated with a later building survive. When the first castle was built at Wester Greenock isn’t known, however the lands of Wester Greenock are thought originally to have been a part of the wider lands of Greenock. A Hugh of Greenock swore to Edward I of England in 1296, and although his surname isn’t recorded he is assumed to be an ancestor of the Galbraith family who held the lands of Greenock by the 14th century. When Malcolm Galbraith died without a male heir the lands were divided between his two daughters, with Easter and Wester Greenock being split by the Strone Burn. Malcolm’s elder daughter received the lands of Easter Greenock and when she married Malcolm Crawfurd of Loudon the estate passed to that family. Malcolm’s younger daughter married a Schaw (later known as the Schaws of Sauchie) around 1420 and the lands of Wester Greenock went with her into that family. 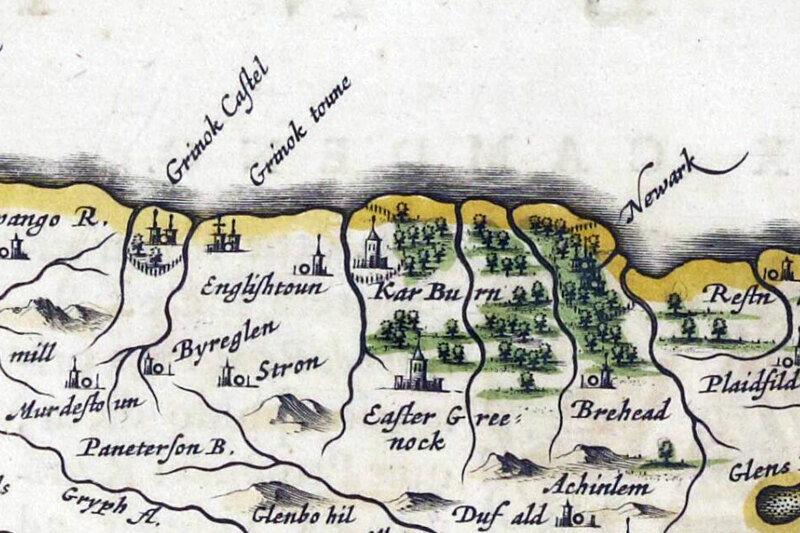 Some references state that by the middle of the 15th century the lands of Wester Greenock were part of the neighbouring estate of Finnart belonging to the Earl of Douglas. However this may not be the case and may have arisen from some confusion. When the Earl of Douglas forfeited his estates in 1455 the eastern part of Finnart, supposedly including Wester Greenock, was granted to James Hamilton, 1st Lord Hamilton. They later passed to his illegitimate grandson, Sir James Hamilton of Finnart, until he forfeited them and was executed for treason in 1540. James V granted the lands of Finnart to Sir Alexander Schaw of Sauchie and Greenock in 1541 and they were conveyed with the “auld castellsteid, castell, tour, fortalice and manor place new buildit”, however no mention is made of Wester Greenock being transferred at this time. The confusion seems to arise the following year, 1542, when Sir Alexander gave the lands of Finnart, in addition to the lands of Wester Greenock, to his eldest son John. It seems that it has been concluded from this that the estate of Wester Greenock was part of the estate of Finnart, when actually they were separate. This is backed up by a reference to the lands of Greenock being infeft to Sir Alexander’s father, Sir James Schaw of Sauchie, in 1492. He also received a charter under the Great Seal for the lands of Greenock-Schaw, presumably another name for Wester Greenock, in 1506. By the late 15th or early 16th century there was an L-plan tower house on the site, possibly incorporating earlier work. It has been speculated that an older castle may have stood immediately to the west of this tower, although no evidence of this remains. The site occupies a fine defensive position on a steep, high bank with views along the River Clyde, with the land falling away sharply to the north and east sides. The main block was rectangular in shape and aligned approximately north-east to south-west. A small wing projected west from the south-west corner with the entrance and a stair turret in the re-entrant angle to the north, while a second small wing, possibly a later addition, projected east and south from the south-east corner. 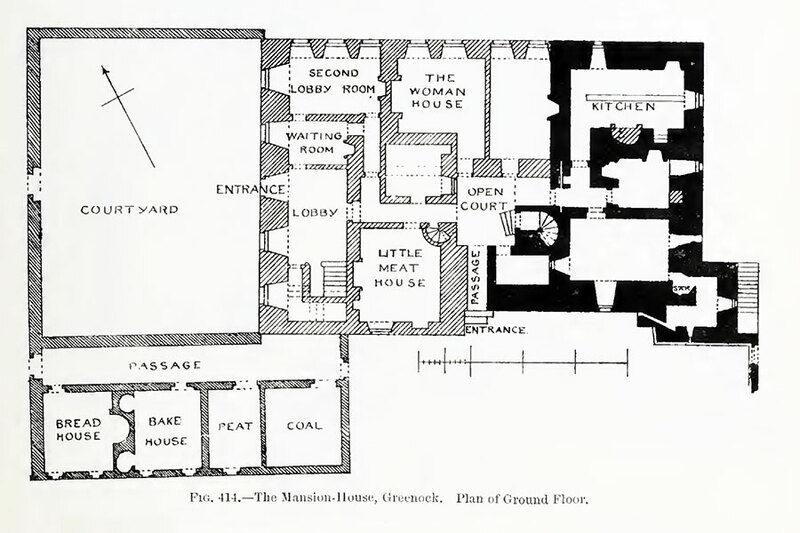 The ground floor was vaulted and housed a large kitchen at the north-east end, a smaller room containing an oven to its south, and a cellar to the south of that. A door immediately to the north-east of the stair tower gave access to the ground floor. The stair tower would have provided the main access to the main hall on the first floor, while a second smaller staircase led up from between the cellar and the south-east tower. Above the main hall there would have been bedrooms on the second floor. Extending approximately west of the tower was a courtyard enclosed by a 1.6m thick wall. 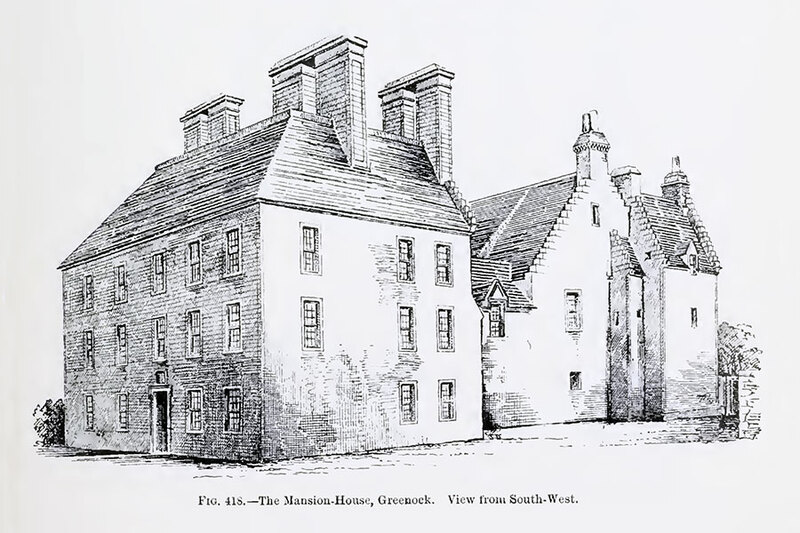 John Schaw’s fourth son, also John, inherited Wester Greenock from his father and owned it from 1620 until 1679. He seems to have carried out a lot of work on the property as several date stones on the castle carried dates from this period. To the west of the castle, beyond the courtyard, is a stone structure covering a well. Consisting of a tall square-based pyramid supported at each corner by small columns it is carved with the date 1629 and the initials JS and HH for John Schaw and his wife Helen Houston. A garden entrance was dated 1635, a back entrance to the property was dated 1637 and the date 1674 was carved above the doorway leading into the stair tower. Just south of the courtyard and west of the castle was a long range containing a bakehouse and peat and coal stores. It was an important and prominent building at this time, and on Blaeu’s map it is shown as a large castle named “Grinock Castel” within a stockade. In 1669 Sir John bought the majority of the lands of Easter Greenock from their then owner, Dame Margaret Crawfurd, Lady Kilbirnie. In 1670 he was granted a Crown charter allowing him to unite Easter and Wester Greenock into a single barony, the Burgh Barony of Greenock. Sir John died in 1679 by which time Wester Greenock had become partly ruinous, the western section of the building having fallen. He was succeeded by his son, another John, who went on to serve as Lieutenant-Colonel in the Earl of Dunfermline’s brigade in the army of the Covenanters. He was knighted in 1651 and created a baronet in 1687 and was styled Sir John Shaw of Greenock, 1st Baronet, Kt. His first wife was Jean, daughter of Sir William Mure of Rowallan. Upon Sir John’s death in 1693 Wester Greenock passed to their son John, 2nd Baronet, who married Eleanor, the eldest daughter of Sir Thomas Nicolson of Carnock. 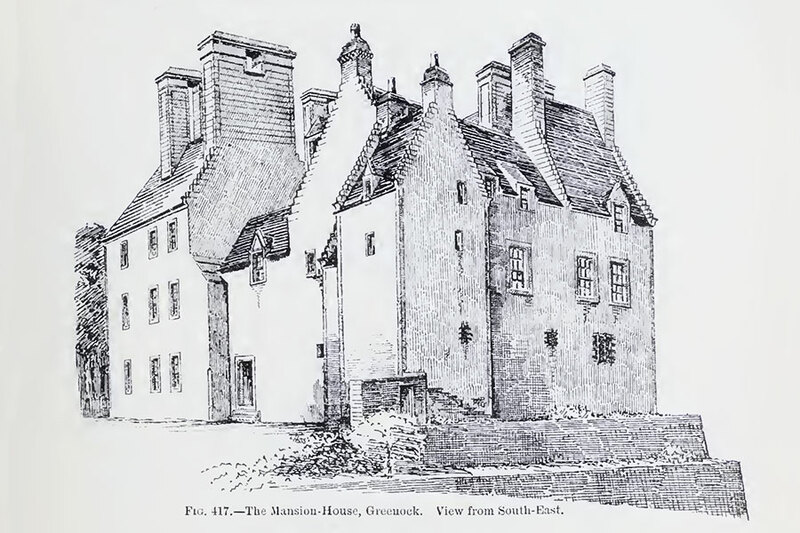 They lived Carnock House in Stirlingshire rather than at Wester Greenock, although plans were drawn up to renovate and rebuild Wester Greenock. These plans came to nothing however when John died of gout in 1702 at the age of 44. John’s son, another John, succeeded his father as the 3rd and last Baronet. He had five sons and one daughter but all the sons predeceased their father. Wester Greenock seems to have passed to his daughter, Marion, well before his death in 1752 and it may have been given to her in 1718 when she married Major-General James Cathcart, 8th Lord Cathcart. Early in the 1730s Lady Cathcart commissioned a new rectangular mansion block to be built on the ruined section which was designed by James Watt, the father of James Watt the inventor. This new wing incorporated a section of the courtyard wall into its symmetrical western facade, and was separated from the old castle by a small internal courtyard. Lady Cathcart died in 1733 at which point Wester Greenock may have returned to her father, John, the 3rd Baronet. 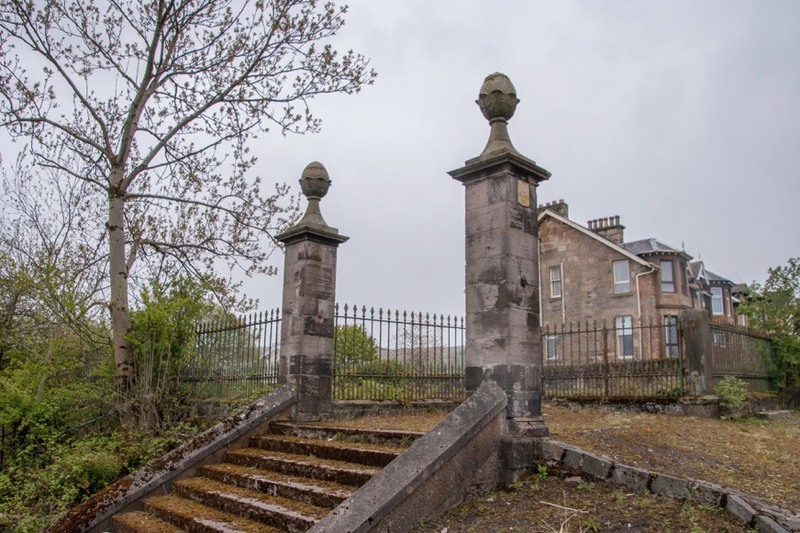 Upon his death in 1752 the Greenock estates passed to his great-nephew Sir John Shaw Stewart, a great grandson of the 2nd Baronet’s sister and the eldest son of Sir Michael Stewart of Blackhall. The family moved to Ardgowan in 1754 and Wester Greenock was then let to various tenants. The vaulted ground floor was used as a prison for French soldiers during the Napoleonic Wars. Sir John commissioned the building of a new property, Ardgowan House, which became the family’s main residence. He died in 1812 and was succeeded by his nephew Sir Michael Shaw Stewart, who in turn died in 1825 and was succeeded by his son Sir Michael Shaw-Stewart. This Sir Michael died in 1836 and was succeeded by his eldest son Sir Michael Robert Shaw-Stewart who sold Wester Greenock to the Caledonian Railway Company. They demolished the house in 1886 in order to run a railway under the site in a tunnel. Much of what we know about how the castle and later house looked is thanks to MacGibbon and Ross who were shown plans and drawings by Lord Cathcart and recorded what was still visible when they visited. A painting of the property, titled “Mansion House, Wellpark, Greenock” by David Maitland MacKenzie hangs in the McLean Museum and Art Gallery in Greenock. 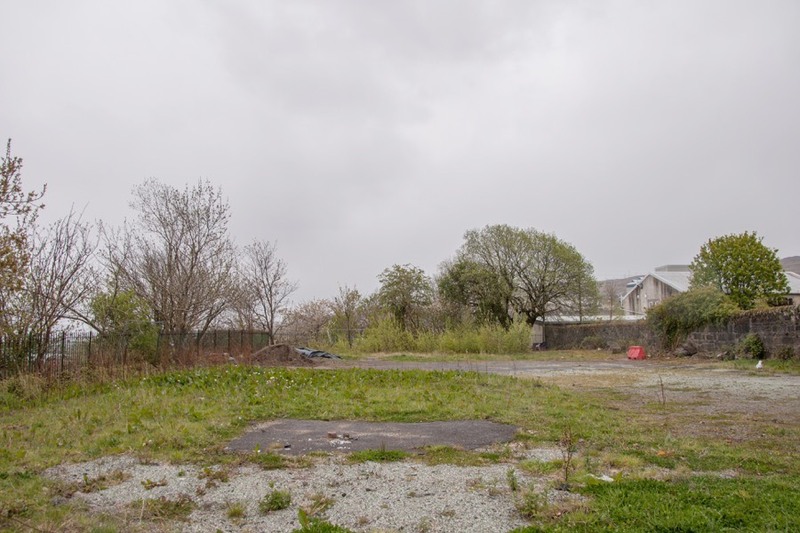 Today the site of the castle stands empty and overgrown. The 17th century well still stands, now in a public park known as the Well Park, as do the gate piers at the north corner of the site. Greenock Castle is in the parish of Greenock and the county of Renfrewshire. Published on the 9th of February 2012 at 12:39 am. Updated on the 10th of May 2018 at 3:29 pm.